Meet the Santa Cruz Sheriff Department's current most wanted suspect: 42-year-old Dmitri Koa Storm, a.k.a. "Dragon," a.k.a. "Wushen," a.k.a. "Casey." 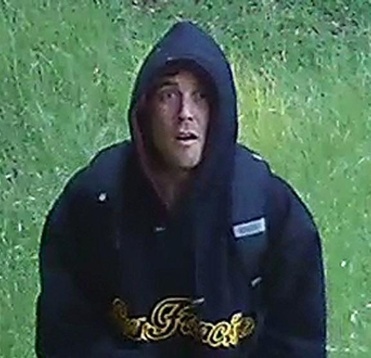 Wanted for string of 10 auto thefts along the coast from Big Sur to San Mateo County, Storm has apparently been able to evade authorities for months by constantly changing his appearance to look like various forgettable white dude stereotypes. Judging by the sheriff department's handout above, Dmitri Storm's impecable repertoire of alter egos ranges from: "startled hoodie Steve" to "Ras Trent" to "chisled-jaw Chad." According to his mother, he's a schizophrenic and his spree of grand theft auto is an episode triggered by a recent breakup with his girlfriend. His M.O. is to steal a car, slap another stolen plate on it and drive around for a few days before ditching it for another one. As one Santa Cruzer put it on Facebook: "This guy never looks the same twice, on a day to day basis, and could be in the middle of a Kmart parking lot and you wouldn't be able to spot him. He is a natural born criminal." On April 17th, Storm was believed to be either morning-drunk or very high on drugs when he pulled into the Big Sur General Store in Monterey County at 8 a.m. and challenged the cashier to fight at knifepoint. He took off south down Highway 1 doing 100 mph in a stolen Lexus, zipped over the Bixby Canyon Bridge and ditched the car in Palo Colorado Canyon. He somehow evaded police, who were staked out waiting for him to slip up and managed to flee the area in a stolen Jeep Grand Cherokee. He was last spotted a few days later on April 22nd, when he stopped the stolen grey Mercedes he was driving to pick up a woman hitchhiking along Highway 1 near the border of Santa Cruz and San Mateo Counties. Being the suave man of mystery that he is, Storm pulled into a lookout along the highway around midnight, but the encounter apparently turned south when Storm mentioned he had a knife on him and the woman probably started getting the sense that she had gotten herself into the wrong kind of road movie. She called 911 and Storm took off on foot along a hiking trail. By 4 a.m. the next morning a car in Palo Alto was reported stolen and authorities believe Storm had struck again. Authorities say Storm has a history of violence (and apparently, expensive taste in automobiles), and should be considered armed and dangerous. There is a measly $500 reward for any information leading to his arrest. His mother, meanwhile, would really like him to turn himself in.